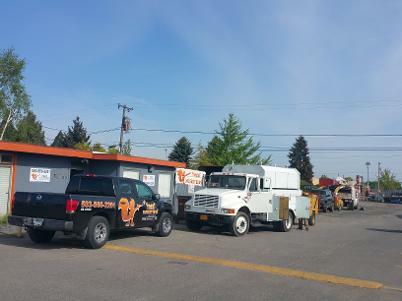 Residential and commercial tree services in Salem, Oregon and surrounding areas. Reasonable rates and quick response for your tree service and tree care needs. Services include tree pruning, tree trimming, tree removal, tree stump removal, landscape maintenance, lot clearing and much more. Our experienced tree climbers and crew rope tree branches as they are cut so they can be safely lowered without harming objects below. Licensed arborist on staff and ready to address all of your tree service needs or concerns. When you trust your tree services, hedge trimming, or lawn care project to Tree Musketeers Tree Service you can be sure that you are receiving the absolute best customer service and quality in tree services possible. We are reliable professionals specializing in all aspects of Tree Services, tree pruning, tree removal, stump grinding, landscape maintenance, lot clearing for both residential and commercial properties. Whether you need immediate tree removal or general tree maintenance our team of tree care professionals have the experience and the equipment needed to complete the job both safely and effectively. We listen to our customers and work with them to meet their tree service needs with exceptional quality and great rates!